The goal of WP1 is to plan and undertake all necessary activities for the project’s effective coordination, including: i) manage the partners and resources to reach the general objectives and goals of the project, on time and with the budget allocated; ii) provide internetworking tools for communication between partners; iii) provide a plan for knowledge management, IPRs, and exploitation of results; iv) initiate the project with success by clarifying the project and WP objectives, the monitoring and reporting processes and the working responsibilities to all involved parties; v) set up and administrate the tools, operations and documents for the efficient cooperation and communication among all involved parties; vi) plan and monitor the required activities for the timely and qualitative implementation of the project deliverables within the planned work packages; vii) monitor and control the project progress and resources, ensuring the direct and in-time information flow in every decision making level; viii) identify potential risks and changes (internal or external) and manage them effectively through predefined techniques; ix) ensure that ethical rules and codes are maintained; x) close the project with success by delivering the project final outcomes and setting the basis for their commercialization. With respect to administrative management the responsibility of this task is to establish a stable management basis and ensure a firm and accepted foundation to the project prior to commencement of the work. This task includes building upon the terms and conditions specified in the Consortium Agreement, define and set up the practical mechanisms which implement the management functions. These include communication between the Steering Board and MAMEM partners, EC officials and external organisations and individuals. Moreover, the administrative management entails also the organization of the consortium meetings, meetings with the advisory board and technical meetings. A set of documents will be generated as described in Section 3.2 supporting management activities (Management Charter, Management Handbook, Communication Plan and Quality Plan). The financial management entails the establishment of a plan ensuring that the expected income, expenditure, and disbursements are clear and verifiable. It also includes reviewing the financial status monthly, report on progress to the Steering Board at quarterly meetings, verifying that audits are carried out for all partners and that audit certificates are received. The technical management is a repeatable process that aims at monitoring and establishing the specific form and content of each deliverable, resolving what activities are necessary for their creation and delivery and at determining specific dependencies between deliverables. The technical management includes also the monitoring and control activities of the Project Management Board (PMB) and the Project Technical Manager (PTM) in ensuring that a WP stays on course and reacts to unexpected events. The process forms the core of the PTM’s effort on the project since it is the process that handles day-to-day project issues. Throughout a WP there will be a cycle consisting of authorizing work to be done, gathering progress information about that work, watching for changes, reviewing the situation, reporting and taking any necessary corrective action. The role of technical management is to cover these activities, together with the on-going work of risk analysis and contingency planning, change control and bi-monthly reporting to the PMB. To efficiently handle the large volume of project documents (including reports), all project members will use a specialised web-based Document Management Tool supported by the Project Technical Manager and Project Assistant. The quality management of the project will be implemented through a Quality Assurance Plan (QAP) that will be established with the objective of ensuring high quality outputs of the project activities, thorough review of the project deliverables and regular assessment of the project progress and achievements. The QAP will specify all quality control procedures, including responsibilities of project participants (Project Technical Manager, WP Leaders, Task Leaders and other partners), contract management, documentation control, documentation formats and exchange rules, deliverable assessment, etc. The QAP will ensure that work conforms to the requirements identified in each WP, that the work is done and that completed modules/products/deliverables meet the quality standards set. The QAP will request internal progress reports to be provided by each partner on a quarterly basis summarizing progress, achievements and usage of resources. This task also includes strategic monitoring and possible re-planning of MAMEM activities to ensure all project objectives are achieved on time. This task deals with the detection and assessment of the knowledge generated by the consortium. This knowledge will be initially identified at the beginning of the project and will be constantly monitored throughout the project’s lifetime based on an IRP plan. Since it is possible that key IPR could be delivered at any time in the project two versions are scheduled. This plan, as it is described in more detail in Section 2.2.3, shows how all WPs will be evaluated for their expected patent applications and software copyrights. This task will also make sure that the necessary steps are taken for protection of this intellectual property, e.g., by ensuring confidentiality of information as necessary, and by the timely filing of patent applications by the appropriate partner. The general objective of WP2 is to provide guidelines and best practices for the configuration, calibration and synchronization of the sensor modules that constitute the core of MAMEM technology. This technology is built on three different sensor modules, i.e., an eye tracker, an EEG recording system and a set of bio-sensors. The technological limitations of each discrete module will be investigated and the description of its configuration will be introduced. Additionally, great emphasis will be given to the configuration of the overall sensor installation (i.e., the combination of the modules) as the synchronization and the real-time functionality are a prerequisite for autonomous BCI systems. Finally, the specific target group requirements will be considered right from the beginning of WP2, i.e., from the selection of the sensors to their calibration and parameterization. The work performed under WP2 will contribute in addressing Obj.1 (cf. Section 1.2) by undertaking the following tasks. The goal of this task is to specify the parameters of the eye-tracker that best fits to MAMEM’s requirements. Though the eye tracking techniques available today are highly sophisticated, they are still far from perfect. We assume that it will be even more difficult to track the eyes of people who have lost their fine motor skills, because this may also affect them positioning their head or they may even shake involuntarily. Therefore, in this task we will adopt a novel approach for eye-tracking where the signals recorder by the eye tracking glasses, i.e. eye fixations and saccades, are accurately mapped to the corresponding point from the display, which is looked upon by the user. The advantage of glasses is that it is easier to track the eyes, but it requires additional synchronization effort then to find which spot on the display is monitored. The sampling rate will be chosen to be minimal regarding the computation cost (real-time functionality), but yet the highest possible to ensure high quality information. Over-sensitive trackers lose calibration far too soon. The compromise between efficient eye-tracking and the time spent for calibration will serve as the basis for the configuration of the eye-tracker. The goal of this task is to define the EEG recorder specifications that will facilitate the process of translating the captured brain electrical signals into mental commands. In the first stage the general configuration will be addressed, while in the second stage the initial configuration will be reviewed incorporating the results of the first phase pilot trials performed in WP6. Overall, the EEG recorder has to be as less cumbersome as possible and the preparation time has to be decreased towards an easy-to-use BCI system. The exact type of electrodes (i.e., wet vs. dry, saline vs. gel) will be explored towards efficiently capturing EEG-signals with unobtrusive and non-invasive solutions. Other parameters, i.e., the sampling rate and the electrodes number and positioning will be investigated based on the requirements of the problem at hand. The particularities of user disabilities will play a vital role in deciding on these parameters and the overall configuration. For instance, the EEG signal contamination induced by head tremor (i.e., a common symptom in PD) will have to be reduced, e.g., by applying bandpass and notch filtering to the recorder signals. The parameters and the type of filters in this pre-processing phase will be selected based on the trade-off between high performance and real-time functionality. Similarly, the noise induced by cable movement will have to be eliminated, e.g., by using a wireless configuration provided that the bandwidth is sufficient. Moreover, the use of active electrodes will be explored as they help to accomplish high signal-to-noise ratio, which is extremely important for ‘out-of-lab’ functionality. The module configuration will be further tailored to account for user’s comfort and usability issues. Finally, the time required for calibration will be also considered in deciding the optimal configuration setting. The goal of this task is first to select the most appropriate bio-measurements and then to specify the configuration and calibration procedure that is necessary for tuning the received signal according to the requirements of our system. Sensors providing galvanic skin response (GSR) and heart rate (HR) measurements will be evaluated and the most appropriate will be selected in terms of balancing the trade-off between the effectiveness in capturing the user’s emotional context (i.e., stress level) and minimum calibration time. The bio-measurement module will be selected to be adaptive to user particularities, i.e., the module will be able to operate based on the GSR or the HR alone or by combining these measurements. The goal of this task is to bring together all independent sensor modules designed in the previous tasks (T2.1-T2.3). The overall sensor installation will be implemented herein taking into account real-time and large-scale data manipulation. The parameters of each module will be optimized in an attempt to facilitate synchronous recording and data processing. In this context, the requirements imposed by the technical aspect of data acquisition (i.e., limitations in sampling rate of eye-tracking and EEG recording) will be jointly considered, taking also into account the requirement to turn the sampled signals into smooth interface operations. For instance, in order to translate a specific wave pattern of eye movements into a movement of the display pointer we might need a sampling rate for the eye tracker much higher than the typical mouse sampling rate. With respect to synchronization, given the anticipated differences in the sampling rates of the different sensors (i.e., eye tracker, EEG recorder, bio-sensors) the use of the appropriate strategy for time-stamping the received signal will be essential for their consistent alignment. In this respect, we plan to consider the adoption of an asynchronous strategy for acquiring the signals where each signal is being sampled at its own rate. Then, precise time stamps are associated to every data chunk which can be used for the time-alignment of the signals and their synchronized processing. Equally important are also the strategies adopted for reading (e.g., blocking/unblocking reads, re-sampling), storing and representing the data so as to be able to facilitate the data flow that fits the needs of the application at hand (e.g., recording or real time processing). The strategies that we plan to investigate have been successfully implemented by RTMaps, which is a component based framework for real-time, multi-modal applications. Finally, T2.4 will also investigate the design of an auto-calibration setup for the overall sensor installation, requiring minimal effort and no expert knowledge. If necessary, this auto-calibration setup will be complemented by the design and implementation of a series of calibration and fine-tuning processes for the adaptation of the system to the requirements of a home environment. The final goal is the development of a lightweight installation for the necessary sensors that will be easily portable and appropriate for non-controlled environments. In this work package, we will develop algorithms that take the signals from eye tracking, EEG and other bio sensors and interpret them to meaningful commands at a low level (e.g., onMouseMove), a meso level (e.g., onMouseOver, onMouseClick, onKeyStroke, or ticking a box) or at a high semantic level (e.g., selecting n items out of m given ones) (Obj.2). Each input will be considered independently, to extract as much information possible, and combined to create robust algorithms for accurate interpretations of the user’s intention. The number of accurately recognized mental commands will be explored and the limits of the technologies will be evaluated. WP3 will exploit the full range of acquired data and focus on the development of advanced signal processing techniques that will act as the core of the MAMEM mental strategy by undertaking the following tasks. The existing analysis mechanisms, such as dwelling time, number of fixations, etc (examples of what we have used before and how we compared to others are e.g. described in (Walber et al., 2013)) will be evaluated for use in the MAMEM set of algorithms in order to come up with low-level (similar to onMouseMove) and meso-level (similar to onMouseOver, ticking a box) explanations of user activity. To this end, we will conduct initial studies with control subjects employing pattern recognition and gaze-tracking algorithms to determine correlations, precision, recall and accuracy of eye activity with intended low and meso level operations of the target software. At this first stage of algorithm implementation, the requirements set from the target-user disabilities will be used to fine-tune the parameters of the eye-tracking algorithms. More specifically, retaining high accuracy in the case of PD is a big challenge for the eye tracking algorithms, which will have to be able to capture the eye at high head velocity and ensure short recovery time to cope with the eye and head tremor. As part of this task we will also consider the ease of learnability of control widgets by test subjects. The algorithms developed in this task will be wrapped as widgets that will become part of the middleware and accompanying SDK developed in WP4. The exact set of low- and meso-level controls to be implemented will be determined in the initial requirements phase of this task. At a second stage, the feedback from the first-stage experiments conducted within WP6 will be incorporated to further improve the performance and implement the final version of the eye-tracking algorithms. The goal of this task will be to develop robust algorithms for the translation of raw EEG data to meaningful mental commands. The selective attention (relying on the P300 and SSVEP) and motor imagery techniques (relying on ERD/ERS) will be evaluated to find out which of these methods best fit to MAMEM requirements. Additionally, ERPs analysis will be conducted to explore the contribution of other potentials, e.g., the N400 component, to the interpretation of brain activity to mental commands. Additional EEG features appearing in the time and frequency domain will also be employed as complementary elements to enhance the overall performance of the algorithms. MAMEM will use self-paced brain-computer communication techniques to discriminate between intentional control and non-control state (Scherer et al., 2008). For the development of self-paced BCI it is essential to train the user to reliably induce distinctive brain patterns and the BCI to detect those patterns. The non-control state will be automatically detected through a “brain switch” triggered at the absence of motor-imagery related activity. These techniques will provide natural communication channels and enforce synchronization of BCI with time-dependent media. Above all, the real-time requirement and the hardware limitations (as specified in WP2) will set the guidelines to the extent of the feature extraction and classification techniques that will be employed. In order to develop reliable results, this task will be developed in two stages. In the first stage, an initial algorithm version will be implemented to explore the feasibility of extracting low and meso level mental commands (i.e., zoom, rotate, crop, right, left, etc) from brain signals. Additionally, the user individual characteristics and the effect of these on the way the brain is functioning will be studied extensively. For instance, it has been reported that age and gender affects the amplitude and latency of the P300 component (Gong et al., 2011). Regarding the MAMEM specific target groups, i.e., the PD and the MD group, the effect of the user medication on the brain activity (e.g., in the PD case, Levodopa induces modulation of beta and theta oscillations (Alonso-Frech et al., 2006)) will be explored to calibrate the parameters of the EEG signal processing algorithms. During the second stage, the parameters of the algorithms will be fine-tuned according to the results of the first stage experiments conducted with patients in WP6 towards the enhancement of the algorithms’ robustness. Stress context will be used in two ways: a) triggering mechanism to alleviate users through an assistive dialogue, or b) system evaluator. In the first case, assistive dialogues will be presented when the patient is recognized as being stressed while trying to perform an action. The questions in the dialogue will have either the “Yes-No” form for example to undo the last action, e.g. “undo last click?”, or the form of a multiple choice dialogue to perform a difficult action from a set of predefined difficult actions, “Do you mean drag-n-drop or zoom-out?”. The form of the trigger will depend on the event related potentials of the brain signal after or before an action is taken. In the second case, the system evaluator will be a service that evaluates the several prototypes of the project. By measuring stress levels, we will be able to have an unbiased measurement about how well each prototype performs and which interaction paradigm is preferable. In this task, MAMEM will develop semantic widgets of two kinds. First, we will work on fusion techniques to integrate the different sensory inputs to increase the robustness of standard human-computer controls at a meso level, such as the ones described in T3.1 and T3.2. These meso level controls will be necessary for environments that need to be used as they are. For this task, we need to integrate and reconcile different sensory input in order to discover the intended meaning. For instance, dwelling with one’s eyes on an item may not be sufficient to “click” on it, but additional EEG input may finalize this task. For software environments that are highly malleable, such interaction paradigms will much better support the ultimate objectives of the target end users. Additionally, for the integration of modalities MAMEM plans to utilize multimodal fusion techniques, such as the ones used by hybrid-BCIs (Gürkök and Nijholt 2012). The multimodal fusion will be executed in two main levels, i.e., the feature and the decision level. On the feature level, EEG data will be combined with bio-feedback data, e.g. the HR and GSR, to infer the mental and emotional state of the user using naive Bayes and Fisher’s discriminant classifiers. On the decision level, the scores of the EEG, the eye-tracker and the bio-measurement classifiers will be weighted in proportion to the reliability and combined. Data from each modality will be modeled separately (using a model such as the Hidden Markov Model) and the resulting models will be fused together using a probabilistic fusion model that is optimal according to the maximum entropy principle and a maximum mutual information criterion (Zeng et al. 2009). The second kind will incorporate controls at a higher level, such as select-n-out-of-m items, or predict and suggest the sequence of actions that are required to complete a task based on previous usages logs (Pickhardt et al., 2014). These interaction paradigms will be devised to be closer to the way humans plan their course of actions than the machine way of functioning that involves meaningless repetitions. For this case, we will have to analyze the most typical operations performed in the context of multimedia management and authoring tasks, so as on the one hand to dismantle the operation into its constituent basic controls steps (i.e., low-level and meso-level controls) and on the other hand to discover if the same process can be articulated using more elaborated control patterns (e.g., high-level controls consisting of a sequence of elementary control steps). Finally, in this task, contextual sensory input coming from bio-measurements will be used to determine whether the user is in a normal use situation or whether he had further intentions that were either beyond controlling the software or that changed the characteristics of his software use. The exact set of novel interaction paradigms will be initially specified during the first months of this task and will be later on revised based on the results of the first stage experiments. Some of the novel interaction paradigms that have been already identified (cf. Section 1.1.2) include, gaze-based zooming and attention focus, concentration and mind-based activity selection, lazy response on abrupt and flickering signal-commands, auto-complete suggestions based on previous usage logs and select-n-out-of-m items. The general objective of WP4 is to implement MAMEM’s middleware that will run on top of current operating systems and will facilitate, on the one hand, the integration of add-on sensor modules (i.e., eye tracker, EEG recorder and bio-sensors) and, on the other hand, the execution of algorithms processing the captured signals. It will be a vendor-agnostic engine able to communicate with the majority of existing sensor solutions (i.e. EEG, eye-tracker, bio sensors). It will also simplify the process of using the existing APIs for the function calls on current operating systems. WP4 will follow the guidelines and best practices of WP2 for obtaining calibrated and noise-free signals and will act as the programming environment for the algorithms developed in WP3. Finally, it will be the enabling platform for the prototype interface applications developed in WP5. The work performed under WP4 will contribute in addressing Obj.3 (cf. Section 1.2) by undertaking the following tasks. The goal of T4.1 is to design the architecture of the software engine (i.e., middleware) that will allow us to implement the guidelines and strategies specified in WP2 in the context of an operating system. This architecture will specify, among others, the functionalities dealing with the dynamic loading of sensor modules, their instantiation, the management of threads and buffers. Given that such functionalities are very close to the kernel of an operating system and may differ across the existing solutions, our architecture should be designed in a flexible and extendable manner. The final outcome of this task will be a report with the specifications of MAMEM’s middleware that will be used as the blueprint for the software engine developed in T4.2. The goal of this task is the develo pment of the software engine implementing MAMEM’s middleware together with the documentation of the accompanying Software Development Kit (SDK). 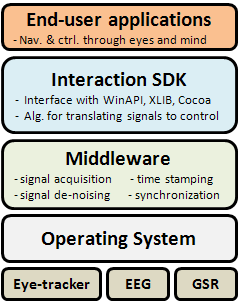 As shown in the figure, MAMEM middleware will run on top of the operating system with the aim to make completely transparent the process of signal acquisition and de-noising, as well as its synchronization through time-stamping. Moreover, through the Interaction SDK our goal is to also make transparent the process of interfacing with the function calls of the underlying operating system for accessing the navigation controls of a software application. In order to achieve this, we will rely on the APIs offered by the operating systems for interfacing with their core (i.e., WinAPI for Windows, XLIB for Linux and Cocoa for OS X). Based on these APIs we will develop the code necessary to provide the control functions specified in WP3, ranging from the low- and meso-level control functions, all the way to the higher control functions implementing the novel interaction paradigms of T3.4. These control functions apart from abstracting the code necessary to interface with the core of the operating system, will also incorporate the functionality of the algorithms developed in WP3 for translating signals into meaningful control. Finally, everything will be wrapped under MAMEM’s Interaction SDK that will offer external developers and interface designers the opportunity to build software applications that can be navigated and controlled through the user’s eyes and mind. Moreover, MAMEM’s middleware and SDK will be designed to facilitate their extension with new, third party interaction paradigms for touch-less interface control. This will be accomplished by offering code templates generated automatically by the SDK wizard and by documenting a complete API for reaching the full set of available function calls while remaining independent from the operating system. Eventually, MAMEM’s middleware and Interaction SDK will be employed by WP5 to develop the prototype interface applications of T5.3. The goal of this task is to ensure that the research outcomes of WP2 and WP3 that have been integrated in MAMEM’s middleware are technically verified with respect to their expected functionality before reaching the prototype interface applications and the pilot trials. In order to ensure that the developed solution meets its expected requirements, validation sessions will be put in place. These validation sessions will rely on an Assembly, Integration and Validation (AIV) plan that will be written in parallel with the implementation of MAMEM’s middleware and SDK. This plan will be structured in two parts; the first specifying the tests necessary to verify the proper functioning of the overall sensor installation when installed into a new place and the second specifying the integration protocol (i.e. fix the integration interfaces and practices) between the individual components and the middleware. The goal of this protocol is to allow individual components to work independently on algorithmic refinements and optimizations, while ensuring their smooth integration with the project’s unified solution. Finally, the validation tests will be put in action by the partners responsible for the pilot trials (SHEBA, MDA Hellas, AUTH) as part of WP6 activities and under the supervision of WP6 leader. In this way, we will verify that MAMEM middleware and SDK function to the expected performance criteria in an environment close to the end-user environment. This will ensure that the enabling technology has reached the necessary quality level for supporting the pilot trials. The general objective of WP5 is to provide user modelling, and the basic principles and paradigms for interface design. First of all, crucial to MAMEM is modelling of users (based on relevant characteristics as (dis-)abilities, interaction behavior, emotions, intentions, social abilities and social network, extend to which training is needed, and sensitivity to persuasive strategies. These models will be used as input for several WP’s and tasks. Second, equally important as to user models, is a specification of the persuasive design principles to influence those users (e.g., increase adherence to therapy/exercises, increase trust in the interface). Finally, all the above will be used as the basis to design the necessary interfaces and develop a set of prototype applications that will be used during the pilot trials. The work performed under WP5 will contribute in addressing Obj.4 (cf. Section 1.2) by undertaking the following tasks. This task will describe design principles based on a novel persuasive technology framework for personalized interface design. It will define a taxonomy of motivators and a set of principles for deriving new motivators that can be used to change the behaviour or attitude of a person in terms of social inclusion, increasing trust, and diminishing reactance effects. This taxonomy will categorize motivators (indicating their suitability and effectiveness) for different types of users (differentiating for relevant characteristics which are specified in T5.2, like type of (dis-)abilities, sensitivity to persuasive strategies, personality, intentions, etc. ), different types of situations (hospital, revalidation, home), and availability of other motivators (social: personnel, relatives, friends; financial: income, insurance; illness related, etc). Fundamentally, this framework for personalized interface design will be based on existing, well-accepted models of persuasive technology (Fogg, 2002; Oinas-Kukkonen & Harjumaa, 2009) taking into account the psychological implications delivered by the user (dis-)abilities. So, for example, (based on the motivator taxonomy) this framework might indicate that for a person who is sensitive to authority-based persuasive strategies, the interface should contain prominent references to relevant authorities (e.g., display very clearly a physician and his or her authority, and the fact that instructions to use the technology came from this person). Also, the framework might indicate that for users who feel lonely, persuasive strategies that include social connectedness (e.g., including forums and connections to other patients) will be effective in motivating the user to use the technology. This task specifies user models and profiles, describing users with regard to relevant characteristics and limitations, such as (dis-)abilities, interaction behaviour, sensitivity to specific persuasive strategies, emotions, intentions, social abilities, extent to which training is needed, social network, sensitivity to persuasive strategies, based on knowledge of user modelling and the specific target groups. Also, it will adapt these models to the pilot trials and evaluation of WP6, as these will provide knowledge necessitating re-balancing these user characteristics, adding relevant characteristics, and new knowledge on these users not previously available in the literature. A set of profiles (personas) will be used to concretize the outcomes of this task that will be used to drive the design of the prototype interface applications. Based on the persuasive design principles (T5.1) user models (T5.2), this task will develop prototype applications that will be used in lab evaluations to examine the actual effectiveness of the persuasive principles (personalized, stimulating trust in the interface) for influencing the behaviour and/ or attitudes of users with characteristics comparable or equal to those of the target population. So, using the framework developed in T5.1, this task will validate the usefulness of the psychology-inspired design principles to the non-conventional target group of people with disabilities. Nourishing on the output of T5.2, this will be done first of all (M13-M20) based on the first version of the user models (literature and clinical specialist based), and secondly on an adaptation of those models based on trial cycle 1 (M28-M32). All the above will be reflected in the design of a set of prototype interface applications that will be used during the pilot trials. In order to develop these prototype applications, we will rely on the middleware and the Interaction SDK developed in WP4 by allocating our efforts along two tracks. In the first track, we will pursuit the scenario of incorporating our widgets for novel interaction paradigms as part of an existing software tool that is amenable to extensions. We will investigate both open source tools like Gallery and vvvP for managing and GIMP, Audicity and Blender for creating/editing multimedia content, but also closed-source tools that can be extended through third-party plugins like Photoshop and Adobe Premier. Our goal in this case would be to enable the highest possible of the control functionality incorporated in these tools through the user’s eyes and mind. In the second track, we will develop prototype applications from scratch by relying on existing powerful standards like HTML5. Our goal in this case is to have full flexibility over the control functionalities that we would like to offer, allowing the design of radically novel interfaces. In this way we will also have the opportunity to aim for the user’s behavioural change as a result of the employed persuasive design principles. Particular attention will be placed on integrating with our prototype applications the functionality to share content in social networks like Facebook, Instagram and YouTube as well as to facilitate blogging functionalities. Finally, detailed instructions on how to setup, configure and launch these prototype interface applications will be provided in order to increase the potential of adopting these applications in a home environment. This task describes training cycle specifications, based on performances of real users, including descriptions of the extent to which training is needed, differentiations for level of (dis-)abilities, and cognitive functioning. That is, the prototype applications developed in T5.3 will include training cycles for the user to get familiarized with the capabilities of the interface, to enhance the user’s performance in using MAMEM’s interfaces, and to increase trust and liking of the interface. Also, T5.4 provides “gold-standard” data of the performances of these real users on the defined training cycles. The overall objective of the WP6 is to provide on-going transformational interface between the engineering developments and the required clinical implementations, in order to translate the technological method to an assistive platform that will empower social involvement of subjects with disabilities. Thus, within this WP, we will define the specific clinical requirements, which are derived from the specific needs of each patient cohort that will participate in the MAMEM project. Then, we will conduct pilot trials with patients to test and improve the usability of the platform, in particular related to multimedia authoring tasks. WP6 will provide a layout that now can be tested with respect to the goal of increasing social interactions through increased participation in web based multimedia authoring activities (WP7). The specific objectives are therefore: i) To define the clinical requirements of MAMEM for three patient cohorts (subjects with high spinal cord injury having tetraplegia, subjects with Parkinson’s disease and subjects with neuromuscular diseases). ii) To define the usage scenario specifications for each patient group. iii) To plan pilot experimental trials with the participation of patients and healthy subjects. iv) To conduct pilot experimental trials with the participation of patients and healthy subjects. v) To delineate each disease specific needs for using the new human-computer MAMEM interaction paradigm. The work performed in WP6 will contribute in addressing Obj.5 and Obj.6 (cf. Section 1.2) by undertaking the following tasks. MAMEM researchers in each clinical centre will obtain Ethical approval, from their respective institutional Ethics Committee. The clinical partners will formulate a consistent protocol across the centres, and in the process will take into account any inconsistencies among the rules and regulations between the countries (if any exist) and will come up with a unified protocol. Each party will be responsible for accurate translation to the local language. The ethical strategy that will be adopted in MAMEM in discussed in detail in Section 5. We will conduct three focus groups of six health professionals in each from different disciplines (Medical doctors, occupational therapists, physiotherapists, nurses, social workers and psychologists) – We will conduct qualitative analysis of the focus groups transcripts. In parallel, we will formulate questionnaires for patients, for care givers and for relatives (e.g., spouses) in which we will identify the current habits and difficulties, involved in computer operation, and the desired goals for improvement. The outcomes of this task will be disease specific end user usage scenarios of the platform in terms of: a) detailed profile of their disabilities, and how these disabilities prevent them from using a computer interface; and b) the subjects’ willingness and motivation to perform multimedia related tasks using MAMEM and ways to increase this willingness. An additional outcome of this stage will be the definition of the clinical profile of the eligible users of MAMEM. e.g., subjects who have involuntary eye movements, or who have undergone procedures that may affect EEG signals (e.g., implanted stimulating electrodes in subjects with Parkinson’s disease), will be considered as subjects with counter indications. In the first stage of this task, we will define experimental protocols to demonstrate the ability of the MAMEM platform to become operational through the users’ eyes and mind. In each clinical site, we will define an experimental protocol specific to the tested patient cohort, which includes definitions of participant’s inclusion and exclusion criteria. We intend to include about 21 subjects in each of the clinical site (see below for time course of recruitment) from each patient group from both genders and in all ages (as relevant to the specific disease, i.e., subjects with Parkinson’s disease are typically older, while spinal cord injuries can occur in all range ages), as well as from an age- and gender-matched healthy group. We will define the experimental set up (adaptations may be needed based on the requirements of a specific target group), and the experimental procedure. The latter includes (1) introduction to the platform; (2) training of users; (3) testing the ability to perform dictated tasks. These tasks will include basic computer operations, starting with moving the mouse cursor, advancing to opening windows, saving files and finally to the more advanced usage scenarios for multimedia management and authoring (cf. Section 1.1.2), including image/video/audio management, image/video/audio editing, image/video/audio authoring and generation of a multimedia presentation (e.g. a slide show). Finally, we will define the following outcome measures: (1) the existence of impasses or hardships in operation of the platform by the patients in any of the stages of the procedure; (2) learning curves based on response errors, reaction times, during the procedure phase of training and then during the ability to perform dictated tasks phase; (3) user satisfaction; (4) care givers and therapist satisfaction. Additionally, we will draw the exact strategy on data security in collecting and storing personal data (e.g., through the use of the INFOR10) to comply with legal and ethical regulations (cf. Section 5). Finally we will define the statistical tools to obtain the results and draw the conclusions. The second stage of this task will be to perform the protocols defined in the first stage. This will be done in clinical sites, each participant will be invited to spend about half a day of practical experimentations in which he/she will be trained and tested in several sessions (the length of the sessions and the number of sessions will be individualized to the subjects, based on their fatigue, compliance etc.). If needed the subject will be invited for a second visit to complete the protocol. The main obstacle which we anticipate is certain frustration and impatience among subjects that will find it hard to employ the new brain-computer interaction paradigm. We intend to first test 11 subjects. From this eleven subjects group, six will be healthy subjects (3 women, 3 man) in age range similar to the age of the particular patient group tested in the particular site (e.g., most likely ages between 50-80 years in the site involving Parkinson’s disease subjects). We will first test the MAMEM platform on the healthy subjects, and then on additional 5 patients. After testing this group of eleven subjects, we will perform interim assessments re-define the experiments as needed and carry a second round of experiments with additional 10 subjects – all of them belonging to the same patient cohort. In summary, in this task we will study 18 healthy subjects and 45 subjects with diseases that impose severe limitation on their ability to manipulate computer mouse and keyboard. For assuring system usability prior to testing the system with patient’s cohort, six healthy subjects will be tested. To evaluate the rate of successful use by patients we intend to quantify, for example, the rate of response errors for multiple dictated tasks such as reaching spots on the computer screen with the mouse cursor. We anticipate that in these trials we will obtain 75-85% success rate (c.f., Obj.3), as opposed to 50% in random cursor ‘cursing’ tasks. The entire process will be reviewed on annual basis by an internal ethical advisor to ensure that all procedures meet the ethic rules approved by the ethical committees (c.f. D6.3). The assessment of the results from the pilot trials will start immediately after the completion of the protocols. Any aspect of the protocol will be evaluated based on the results for each of the three clinical sites. The results of the pilot experimental protocols will be analyzed in ongoing rolling basis, upon completion of each of experiments in each of the sites. We will use statistical tools such as descriptive statistics, regression analysis, in order to quantify the performance of the subjects in terms of learning rate, response error rates, reaction times etc. Similarly, the scores of the questionnaires will be evaluated. The outcome of this task will be reported on the experiments and results, in particular the feasibility of the platform, usability of the interface and effectiveness in performing a certain task. Based on this, we will be able to prepare practical conclusions for performing WP7, for example paradigm usage training protocols. We will re-apply for ethical approvals, in case of modifications in the protocols. The goal of WP7 is to assess the degree of success in bringing disabled people back to the society as a result of their newly acquired ability to manage and author multimedia content. Given that social integration is a multi-dimensional concept that cannot be easily assessed, the main objective of WP7 would be to research and adopt a methodology for monitoring social inclusion in a controlled group of subjects with disabilities. This methodology will be then used as a driver to: a) specify the indicators that will be used for quantifying social integration, b) establish the mechanisms necessary for observing certain aspects of a human’s social activity, and c) assess the impact of MAMEM technology in their digital life and digital productivity. WP7 activities will run continuously and in parallel to the project work plan for technology specification, development and evaluation. Strong interconnection with WP6 will be necessary during the conduct of the focus groups so as to mark down the starting point of the subjects with respect to their social indicators. This will be later on used as a reference point for verifying the anticipated change. The work performed in WP7 will contribute in addressing Obj. 6 and Obj. 7 (cf. Section 1.2) by undertaking the following tasks. The goal of this task is to review the related literature and specify the methodology that will be used by WP7 to monitor the social integration of people with disabilities. The aim of this methodology will be to provide guidelines for specifying indicators with analytical and operational relevance to the measurement of social integration, as well as to describe how such measurements can be put in place. Our starting point will be the study presented in (Atkinson and Marlier, 2010) that deals with the general concepts and principles underlying the construction of social indicators. More specifically, in specifying our indicators we plan to adopt the suggested principal-based approach that determines the following: a) an indicator should identify the essence of the problem and have an agreed normative interpretation, b) an indicator should be robust and statistically validated, c) an indicator should be interpretable in an international context, d) an indicator should reflect the direction of change and be susceptible to revision as improved methods become available, and e) the measurement of an indicator should not impose too large a burden on the subjects. These principles will be applied for the case of people excluded due to their neuromuscular disability and with the intention to measure the impact of managing, authoring and sharing multimedia content. Although the complete portfolio of indicators will be defined during the course of the project, we have already identified two different sources that are likely to provide us with valuable data. The first source relates to the users activity through social media and the importance of multimedia content in this process. As already mentioned Frohlich (Frohlich et al. 2002) verified the emotional payoff for users working with photographs in the creation of collages and described the importance of sharing as one of the main goals of taking pictures. Thus, it is reasonable to argue that social integration can be implicitly quantified by the activity of a person in social networks. In this direction, we will establish a number of indicators that can be automatically measured such as: number of on-line friends/connections/followers, number of posts, number of likes/comments/shares per post, indicators like “people talking about this (PTAT)” or the “engagement rate” (PTAT/likes), overall number of distinct users that liked/shared/commented on a post, expansion of the user’s social graph, etc. The second source relates to the patient’s digital productivity and the existence of links with any type of processes related to workforce. There are many cases (especially in the cohort of Parkinson disease) where patients continue their lives as active professionals regardless of their evolving disability. Despite the fact that they are excluded from a non-negligible number of activities, their good mental health allows them to retain some of their productivity. Another relevant case of disabled people contributing in productive processes is the creative groups organized by the care-giving organizations for producing goods (e.g., gift cards, calendars, etc) that are sold in the market for financial support. In such cases our approach to implicitly quantify social integration will be to monitor for any significant change in the overall throughput of the patient’s labour. However, in contrast to the case of social networks where the indicators can be measured automatically and subjectively, in this case our information source will be the subjective feedback provided by the patients. Based on the indicators defined in T7.1, the goal of T7.2 is to make sure that the necessary mechanisms are in place for monitoring the anticipated change. Working along the already identified dimensions of digital life and digital productivity the activities of T7.2 consists of: a) documenting the full details about the social integration profile of every patient. These details will be initially obtained during the conduct of focus groups in the requirement analysis of WP6 and will be updated twice during the execution of the pilot studies; b) build up the necessary infrastructure for monitoring patients’ activity in social networks. In order to do this in an automatic manner, we will leverage CERTH’s experience on social media monitoring that has been gained through the EU-funded project SocialSensor. As a result of this project, CERTH has already in place a sophisticated infrastructure for harvesting qualitative information from the social media stream. Next to this infrastructure, we plan to also rely on existing tools for social media monitoring like Topsy (timeline, representative tweets, articles, mentions), SimplyMeasured (most important followers), Mentionmapp (network of mentions), LikeAlyzer and Quintly (Facebook page basic stats); c) formulate the questions and the structure of the interview sessions that will be conducted to acquire the information necessary for judging whether there has been any change in the productivity status of the patient. This activity will be performed with the significant contribution of MAMEM’s psychologists (TU/e) for helping the patients to feel comfortable and share information about their everyday activities. These interview sessions will take place after the completion of MAMEM’s first pilot study and will be repeated regularly. The goal of T7.3 is to accumulate the collected evidence and produce a study about the social integration of people with disabilities as a result of gaining access to previously un-accessible computer interfaces. The study will mainly revolve around the paradigm of MAMEM where the eyes and mind of people who have lost their fine motor skills are provided with a new path to human-computer interaction and, consequently, a new path to society. Its intention will be to analyze the potential of bringing disabled people back to the society by means of managing and authoring multimedia content through natural human-computer interfaces. WP8 deals with the MAMEM dissemination and exploitation activities, as well as mechanisms established for impact assessment and fostering innovation. As detailed in Section 2.2, our approach in this work package will rely on ongoing internal plans documenting the foreseen dissemination and exploitation activities of each partner. These plans will be subsequently used by the partner leading the corresponding task to correct or re-define the adopted strategy in case the undertaken activities are not delivering the expected impact. In this way, MAMEM is expected to optimally exploit the resources allocated for dissemination and exploitation activities and create the appropriate ground to foster innovation. The goal of this task will be to establish the dissemination plan by specifying the dissemination objectives, target groups, directions, instruments and impact indicators. This plan will be initially established in the beginning of the project and will be refined after evaluating the results of the first pilot studies (an initial assessment has been already done in Section 2.2.1). After defining this information the strategy that we plan to follow is to provide every partner with a description template suitable for documenting some important characteristics of the intended dissemination activity, such as the utilized instrument, the date and place, its target audience, its purpose, its measurable impact indicator and its link to the project’s exploitable assets (see next section on exploitation). The filled-in templates will be subsequently summarized into tables, composing a long list of concrete dissemination actions that will allow us to assess, follow up and eventually correct the planned actions in terms of the reached measured impacts. The goal of this task will be to establish the project’s exploitation plan by specifying the project’s exploitable assets, the existing competitors, the strengths-weaknesses-opportunities-threads for these assets, the market dynamics, the restrictions imposed by the existing open source licences and the applicable business models. A preliminary version of this plan is established in Section 2.2.2, while Section 2.2.3 discusses in detail our strategy for knowledge management and intellectual property. The professional networks of SMI and EBNeuro will serve as the initial channels for reaching out to vendors that have the potential to bring MAMEM’s products in the market. The demonstration kit described in Section 2.2.1 will be the main instrument for interacting with these vendors. In addition, as mentioned in Section 2.2.2, MAMEM modules (either combined or stand-alone) have the potential to become part of mainstream software applications from the domain of multimedia management and authoring. In this respect, part of our exploitation activities will be devoted in communicating and collaborating with leading vendors in this field so as to include MAMEM outcomes in their official list of third party tools. The exploitation plan will act as the basis for the joint and individual exploitation activities of all MAMEM partners. Particular attention will be placed on taking into account the IPR document developed in T1.3, as well as on establishing clear links with the activities foreseen in the dissemination plan. This plan will prepare the market for MAMEM products and provide opportunities for feedback from potential users of MAMEM technologies. Innovation is an area to be nurtured and encouraged, and sometimes too many processes stifle creativity in the project. For this reason, the goal of this task will be to establish some processes outside the strict technical work plan of the project that will encourage all partners to think more as entrepreneurs than researchers. In order to stimulate this environment, all partners will be encouraged to hold small, task related meetings, where they can brainstorm ideas collectively, and to have demo sessions at consortium meetings so that new results can be rapidly shared. Moreover, leveraging on the fact that EBN and SMI are two of the most active market players in the fields of EEG- and eye-tracking related applications, among the responsibilities of this task will be also to organize two training sessions with the marketing departments of these companies so as to shorten the mentality gap between researchers and marketers. The final outcome of this innovation exercise will be the technology transfer roadmap that will be delivered at the end of the project for documenting the steps necessary for bringing MAMEM results into mainstream adoption.